I love the fact that, in 2011, when we are supposed to be reading all content digitally on our ipads and kindles, one can still visit (some) newsstands and find an artifact as beautiful as Lucky Peach, or Remedy Quarterly. I finally had the opportunity to pick up the former – which made its debut a few weeks ago – and am now paging through the longest, most beautiful, love letter to ramen, ever. 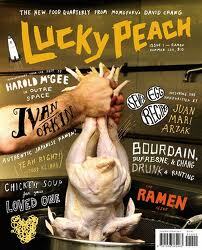 Conceived of by David Chang (of Momofuku fame) in concert with McSweeney’s, Lucky Peach is a new food quarterly that occupies the intersection between food worship, writing and design. This issue is devoted to all things ramen, including an entertaining travelogue through the noodle shops of Tokyo, a handy guide to Japanese regional ramen, and an interview with the proprietor of the number-one selling instant ramen in Tokyo, who also happens to be a Jewish guy from New York who puts rye flour into his homemade noodles. And recipes. Everything from how to make those alkaline noodles from scratch to creative things you can do with instant ramen (gnocchi, anyone?). All this is inspiring me to make another trip to Mitsuwa in New Jersey, pick up some shinachiku and narutomaki, and whip up my own batch of the stuff. Except it isn’t really that easy. Why? Because making ramen involves something like 39 steps from start to finish. Steps we tried last fall, succeeding only marginally. But try again we must. If all else fails, we will make gnocchi out of instant ramen and let you know how that goes. This entry was posted on July 18, 2011, 5:11 pm and is filed under inspiration. You can follow any responses to this entry through RSS 2.0. You can leave a response, or trackback from your own site. That’s an exceptionally appetizing cover. What are Ramen made of anyway? Sadly, not gluten-free. They are made with wheat flour, although their must be alternatives… I am investigating.